We have and have had over many years, brilliant owners, sponsors and supporters and still have room for more! We believe we are pretty good at giving everyone a good time and good value with Team Bleekman. A major company sponsor would be brilliant to have on board – Clissy had the backing of firstly Wadham Stringer – major car retailers – then Intercept Alarms and finally the supermarket giants Gateway Foodmarkets who evolved into Somerfield supporting her in her career which made it all possible. Our sport has so much to offer Sponsors and we are happy to talk to anyone as to what is possible. We have some wonderful owners with their own horses here with us and can always take on more. Leasing one of our current horses is also an option – being an owner made easy! We are also keen to bring syndicates in as owners – either to lease a horse, or horses, from us or to bring their own horse to join our string. Antares – Antares have invited Althea, along with Katie and Janou to join their "Circle A" which is very exciting! All Both girls now ride in Antares jumping and dressage saddles and wear their brilliant hats. "The Antares saddles are a standard above any saddle I have ever ridden in – I won't ride in anything else. The hats are also incredibly comfortable and stylish" says Althea. Rabo Talentteam – Althea is very proud to be selected onto the 2013 talentteam. The support and coaching she will receive is going to be invaluable. A huge help to her! Marksway Horsehage – have been great with their support and sponsorship and Althea has been proud to join them. Top quality feed, easy to transport – a super product with a great record of success with feed and riders. Rodney Powell Back Protectors – “Uncle Rodney” is Katie’s Godfather and makes the best products in his field. His back protectors are the best. Mark Todd Clothing – Mark and Carolyn Todd (Katie’s godmother) have always been great – the Todd’s and the Bleekman’s go back beyond Mayhill to far earlier days. Mark Todd rugs and clothing pop up all over Team Bleekman! Spillers – are helping us with their feed which is, and always has been, the best. It was even possible to have a delivery to our truck in Portugal – service! 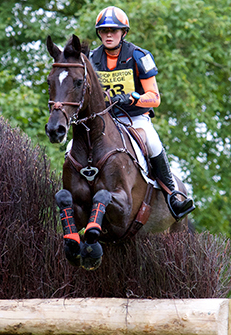 Style Products – Not one member of Team Bleekman would show jump or go cross country without the Style boots. They are fantastic quality and give the horses the best protection possible. Selwood Equine – Selwood are now supplying us with their wonderful range of clothing which looks - and feels amazing! It is brilliant to feel so well dressed in such up to date and comfortable kit. Silverfeet – Our farrier loves Silverfeet hoof balm and we have noticed the difference in a very short space of time in the quality of our horses feet - they look stronger and healthier than they ever have. Protexin – The protexin range is really making a difference with our "tricky doers" - they look really well and seem to be working better all the time. we are very happy! United Konsultants – Supports businesses in all the activities and phases from product design, marketing, strategy and IT. We are thrilled to be working forward with their backing. The Venderbosch family – The Venderbosch's have bred Ziomf and Anmarsch (two of Altheas rides) at their Stud in Holland. They are great friends of the family and have enjoyed seeing Ziomf flying up the grades so much that they decided to add another horse into their venture with Team Bleekman. Anmarsch is a lovely type of horse and has a lot of potential. We love spending time with them in Holland especially at their International event – Varsseveld. Nui's superstar Granntevka Prince is owned by David and Gerry Mills who are the best, we have had such fun with them since Prince joined us at Whorridge. Prince's sister is joining us for 2015 - the royal family grows! Granite Lady (like Prince, an offspring of our great stallion Grannex) belongs to Imogen Rogers-Nash who with her super family are more backers who are brilliant. And Jennie Frewen and family are equally enthusiastic with their support of their wonderful Catch Up Quick with Nui. The other Prince - Prince Apollo - is still followed diligently by previous rider Anna Heywood and her family – we are so lucky to have these owners! In 2014 we had young horses here competing with Alfie and Nui for the Nasse and Henegan families and for Mirabel Helme who were all great fun. Liz Scott is joining us with her Moorland Magic who will start this season in BE100 and we aim to move up to 1* during the year. We need owners like this who love our sport as we do. Althea, Janou and Team Bleekman have some wonderful sponsors and supporters, but competing at the top level in England and Europe requires financial support and we are always looking for more sponsors to join our family! All details of Team Bleekman – Past, Present and Future can be found elsewhere on our website.